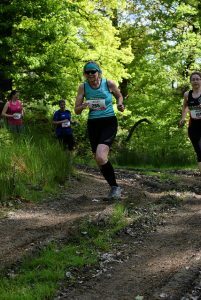 Lesley Pymm reports: At just under £20, I thought twice about entering this race as it seemed a lot to me for a 10k. I actually got in touch with the organsiers and asked where the money was going. Some was going to charity from the junior races, and I suppose we were subsiding them. Anyway, I like Powis Castle and wanted to go further onto the estate so I decided to go for it. I am really pleased that I did. The event is organised by a women’s running group that you may have come across in local events called Dolly Mixtures. Although it was not a women only event, there was a majority of women there – which is unusual. I took my glasses off as I walked into the registration tent and was almost blinded by hi-viz pink which seemed to be everywhere. Numbers had names on them so that spectators and marshals could call you by name. It was chip timed. The junior events were first and the children were really going for it – there was some real talent there. They had a warm up which I didn’t join in as the last time I did that I pulled something, so I always aim to do my own warm up. Anyway, watching them it did seem to be a ‘proper’ warm up, not an aerobics session that you so frequently see. At 11.00 we were off. I started to realise that this may be a bit harder than I had expected when they said what the winning times were last year. I knew the runners and what sort of time they were capable of, this was going to be hard! It was a downhill start, but that soon changed as we turned and headed up hill fairly soon. I ran past an area where a number of spectators had gathered (including Mike) and realised that this was the section that we came back to about three times in the event. After waving at Mike, I was off still uphill. It never seemed to stop. The trails were very good and there was some rain water that had gathered from the previous day. I was behind a number of runners who were in single file on the bit in the middle between the puddles. I made myself very unpopular as I passed them all, splashing as I went. There were some lovely views as we climbed higher and then we got to a turn around point and went downhill. The sun was shining and it was very warm, so it was a relief to get into the shade. After a while I came again to the point where Mike was still shouting encouragement. A grin at him and then I was climbing again. Thankfully there was a drink station up the hill. which was very welcome. A lot more climbing and then the view was fantastic. I would really like to have a map of the course as I’d like to be able to see exactly what I was looking at. There were bluebells and garlic in the woods and it was all on private land that is not usually open to the public, so it was a privilege to run there. The finish was a fantastic, runable, downhill. I loved it. There was a medal, which everyone will know is not something that I really go in for. Anyway, as medals go, it was a good one! More importantly the paper goody bad contained a Mars Bar and flapjack as well as a few leaflets and gel. There was also a banana and water. My time was 1.14.14 (chip) and I made it a bit more than 10k, more like 6.5 miles. There were stalls selling cakes in aid of charity, as well as businesses selling various foods. Bouncy Castle for the children and other games. People were having picnics and were welcome to stay on the event field for the rest of the afternoon if they wanted. We went on to Powis Castle after the presentations. This was a good event. well organised and probably worth the money! I am likely to do it next year and it would be great to see some more teal there. This entry was posted in 10k, Race Reports, Trail by Race Reports. Bookmark the permalink. Dolly Mixtures are all very well,but I prefer Liquorice All Sorts.Sounds like a splendid occasion.Please pass on my good wishes to Mike.